What is the first thing that attracts you when you visit a retail store? The door of course! To make businesses shine, retail stores install storefront doors at the entrance. Commercial storefront doors can boost your business and can play a great role in making your retail store successful. Always remember, the entrance of any business or commercial building is a reflection of you and your business. Storefront doors come in different styles and can be difficult to choose at times. So, before you choose your store’s front doors, let us first understand the different types of commercial storefront doors. Metal storefront doors are made of either steel or aluminum. Commercial steel doors can withstand a lot of abuse and traffic and are best for loading areas or entry points which require a high level of security check. They are long-lasting and affordable, but they are not as stylish as other doors. Aluminum doors, on the other hand, are most commonly used in entrances. They offer a sleek and modern look and are a cost-efficient way to have a good-looking entryway. Both metal and aluminum storefront doors offer plenty of security. Glass storefront doors are the most commonly used entry doors for most businesses. Glass doors can help your building look big and modern. Glass storefront doors come with a single door or double glass doors which lets customers sneak a quick look at what is inside the building. It is, in fact, a wonderful way to showcase the interior of your store to the customers. Glass sliding doors are best for larger stores and offices, as it helps to make entry and exit easier. Adding a glass door can increase sales and attract new customers to your store. Here are some of the benefits of having a glass storefront door for your business. Provides Security-Glass doors can offer extra security to your business. Since it is more exposed to outsiders, it discourages unwanted intruders. Increases Traffic-People usually like to enter a store once they know what products they offer. Glass storefront doors allow you to showcase your product and in turn increase customer traffic. Your business can make huge profits if customers are given enough reasons to come inside your retail store. Glass storefront doors will give you the opportunity to showcase your products and services in exciting ways. Improves energy efficiency- In addition to all the benefits, commercial storefront doors made of glass also help to reduce the cost of businesses as well. This is possible because of using insulated glass which increases energy efficiency and reduces utility bills, apart from giving a modern look to the building. 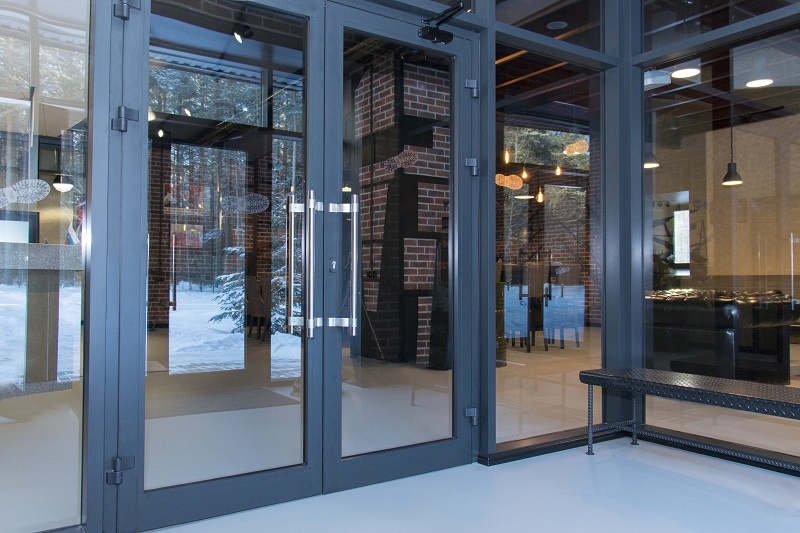 Increases sales- Commercial storefront doors made of glass will help customers to see what goods and services you offer, and this entices them to come inside and view your products. Versatile- Commercial storefront doors made of glass are extremely versatile, as it allows you to showcase products or signage or any promotions that you are offering to your customers. Signages look very attractive on a glass storefront door, so you can use them to attract potential customers and also announce promotions, discounts, and sales.